So this week went okay.. We are still having the hardest time finding people to teach and are in the same situation as last week. Two pluses for this week. One: On Tuesday we took all of the Recent converts and some young men and young women to the Temple. We were able to go and be witnesses for the baptisms. It was a wonderful experience to see those who we taught enter the Temple for their first time. Kofe shared with us that she felt so close to Christ she never wanted to leave. It was a great experience for us all. Two: We taught Io'apa again and He said he is going to quit smoking. He has been having a really hard time but he has had it and we all pray this time he can do it. We also taught a less-active Saturday night and she shared a few things with us and we were able to help her out a bit. We promised her that if she prays and goes to church on Sunday she will get her answer. So on Sunday we were looking for her and she came and while we were blessing the sacrament she looked at us and I could tell she got an answer. It was a really cool experience. I've been trying to look for small ways to serve others. Last week a lady bought some stuff at the store and I took it to her car for her. Then earlier today at the store a few things had fallen over and I picked them up and put them back. The point is, is that service can be found anywhere you just have to plan for unplanned service. It will come up! That's pretty much it for now.. Sorry it's not much! Toni and Tulu whom we got to witness get married. So this week stunk.. Honestly not much happen at all this week so I don't have much to say. A few days we were in town painting the Kings fence for a service project and then the rest of the days were awful.. We work really hard but everyone just tells us that we are almost done so it really doesn't matter. We are trying to re start and find new people to teach. 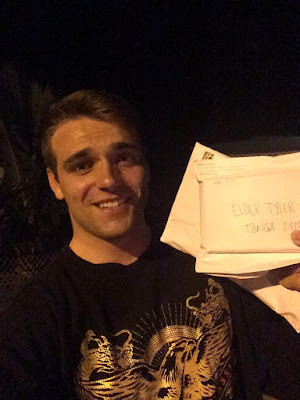 Abe Young was in Fiji this week and had a few friends going over to Tonga so he sent Tyler 2 packages of candy to get him through the next 4 weeks. We Love you Abe!!! First off I cannot believe he is really leaving on his mission!!! Second, I along with Shayler can tell him and testify that you are not called to a mission. You are called to a mission President and the people. I think he will love it!!! I hope I can go through the Temple with him but if he wants to do it before I get home that is fine too. I will just take him 3 times a week when I get home. I would love to have our Homecoming and Farewell together I think that would be awesome!!! To fill you in on my week Kofe is back home and we are going over there in 30 min. I'm planning on inviting her sister. We'll see about the rest of the family. Kofe comes to every activity and is very strong! This week was really slow because of Stake Conference and everyone was to busy. Hey mom I'm sorry we are short on time today we are on our way to Kofe's house. But mom I love you and you raised one heck of a son. Tanner is the man and I can see the light from here. He will save many souls in Reno. Malo 'etau lava Fam bam! So this week was crazy. Not much went on besides our same investigator who just has miracles going on in her life. We found out more of the Miracle but I'll tell you in 6 weeks. So this girl Kofe Manoa was baptized on Saturday. She was planning on telling her mom afterward but we went to pick her up before the baptism and she ended up telling her mom right there in front of us. Her mom freaked out at her and wouldn't really talk to us after. Kofe was scared but she showed up at the baptism and it went really well and was very spiritual. Afterwards she was super quiet and I couldn't really tell what was wrong with her so we went and sat by her. She leaned to me and asked "do you think I made the right decision??" I looked at her and thought and then I asked her what she thought. She said "yes I believe it is right." I agreed with her and told her that she is now a light and an example to her family! She looked at me and said "Elder Swan, you know I'm scared right??" I told her I knew and as tears rolled down her face I just smiled and said " God is well pleased of you Kofe! Just trust in him. Lets go eat!!" She then laughed and we went to eat. As we were walking the second counselor knew what was going on and he reached out and talked to her and comforted her. I was so happy to FINALLY see someone reach out to her. So that is the good news. Later that night she text us and explained how scared she really is. We sent a few scriptures to comfort her then reminded her about church haha. She came to church and received the Holy Ghost! Again such amazing feelings were felt at that meeting. After the meeting she told me she was kicked out of her house and my heart broke. I didn't know what to say. But I did receive revelation while I was at church that we need to invite her family. So I told her that. She laughed and told us to go for it!! Transfers came in last night. I've been praying for weeks to stay in this area again! Guess what!!?? I'm staying and finishing my mission here. These people have become my family. I couldn't think of anywhere else I would want to be. I have a lot to do here. I can't believe it's coming so close to an end.. 6 weeks is too fast but I'm right where God needs me and that is all I need. I apologize that I am unable to put the feelings felt this past week into words. My English isn't great and never was, but I want you to know that This is Gods work and He is watching us in all we do.